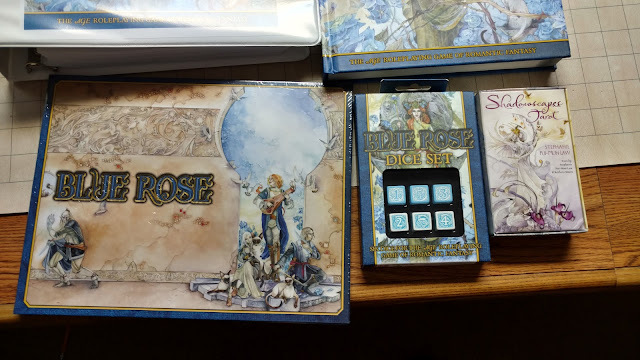 Wrapping up my review on the AGE version of Blue Rose. Part 1 covered Character Creation and Part 2 covered the World of Aldea. Today I am going to discuss the Narrator's Section. 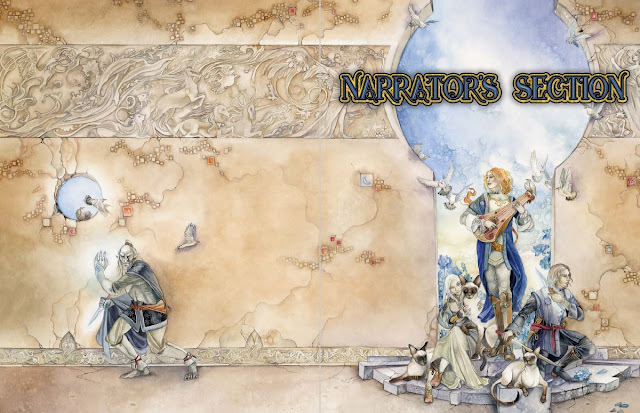 Chapter 8, The Narrator's Art is the GM’s section. Again, I much prefer the term “Chronicler” to “Narrator”. “Chronicler” also implies that the characters are doing something worthy of Chronicling. 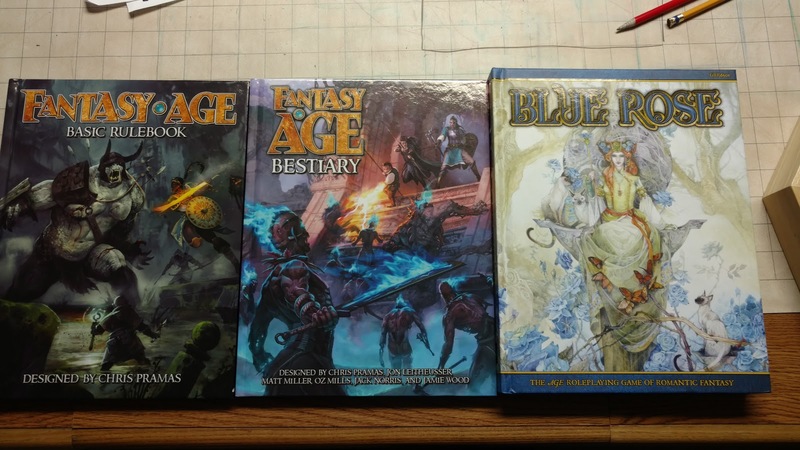 The chapter covers some very pragmatic issues of Adjudicating the Rules and Running the Game to the creative Creating Adventures and Planning the Series. The space in between this is the "Art". What is particularly useful is the very old-school like table of 100 Adventure ideas. Need an idea? Roll a d100. Each one of these can be expanded into an adventure. This flies in the face of any notion that Blue Rose is a limited game. There are guides for roleplaying situations like Romance and Intrigue. Again, while situated in the Blue Rose and AGE systems, they could be used for any game. There is a section on how to run Intrigue (great for me!) and how to do it when the Characters have the potential to read minds or have access to other Psychic Arcana. There is also a bit on the physical location where you play. Given as a means to manage all the information coming at you the Narrator, and also as a means of setting the mood. Blue Rose is a "well lit" game as opposed to horror games which need a dark tone. The book also has some forms here and in the back for Narrators to print out and use to track all the goings on. So bonus point to the PDF for this one. There is advice on knowing who your group is too. I think this is more important for a game like Blue Rose that is very Character focused. Using these group dynamics in the real world can also inform the group dynamics in the World of Aldea. The chapter as a whole has some pretty good GM advice. Some we have seen before and others we have seen, but applied new to this game. Chapter 9 details the Blue Rose Series. If chapter 8 is general GM advice, then this chapter is very Blue Rose specific. This chapter starts out with a note about consulting the players. I think this is good advice in general, but certainly more so for the Character focused Blue Rose. That is not to say you can't have an Adversarial GM (it is one of the options discussed in fact in the last chapter) but if that is what you are doing make sure that is what people want. If so, great! We get into various Series Styles next. While the game is Romantic Fantasy, there is a lot of room in that broad term. Discussed are Dark Fantasy, High Fantasy, Horror, Low Fantasy, Swashbuckling Adventure, and High Romance. All of which work well within the Blue Rose frame. Taking this advice we get some Series Frameworks of potential campaigns/series. 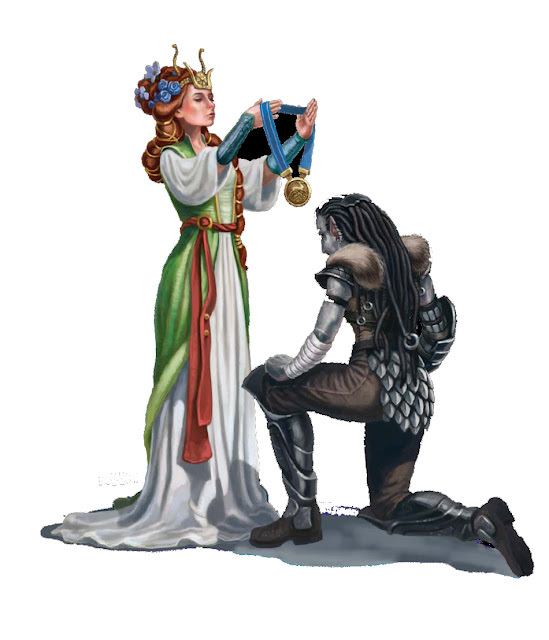 The default, and the one that most people associate with Blue Rose, is called "For Aldis and the Queen!". This is what you would have if a young Mercedes Lackey was your Narrator. It does pretty much what it says on the tin. 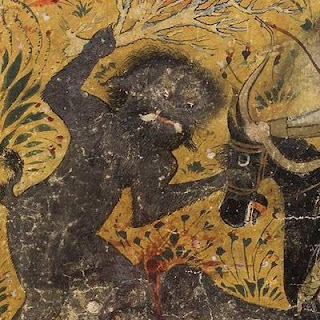 "On the Road" is more of the style of the later Romantic Fantasy authors. It is also closer to the type of adventures you find in a D&D game. Put them on a boat and suddenly it is "7th Sea". "Coming of Age" are your Harry Potter or Narina stories. OR as the book points out, even the Dungeons & Dragons cartoon. "Game of Thorns" (bad, bad Green Ronin!) are your darker court intrigue tales. The nobles that don't trust the queen or her new husband. I could make something of that easy. There are more. The Quiet Knights, the Wedding Planners. But reading through these all should give you your ideas. A special shout out though to "Blue Rose on the Red Planet". That's not what it is called, but the art and the description support that. I'd play that in a heartbeat. Chapter 10 is the actual Running the Game. The first bit we get to is Mastering Ability Tests. If you have any familiarity at all with d20, True20 or a host of other "Target Number" style games then you know what to expect here. Basic tests and Opposed tests are covered again. 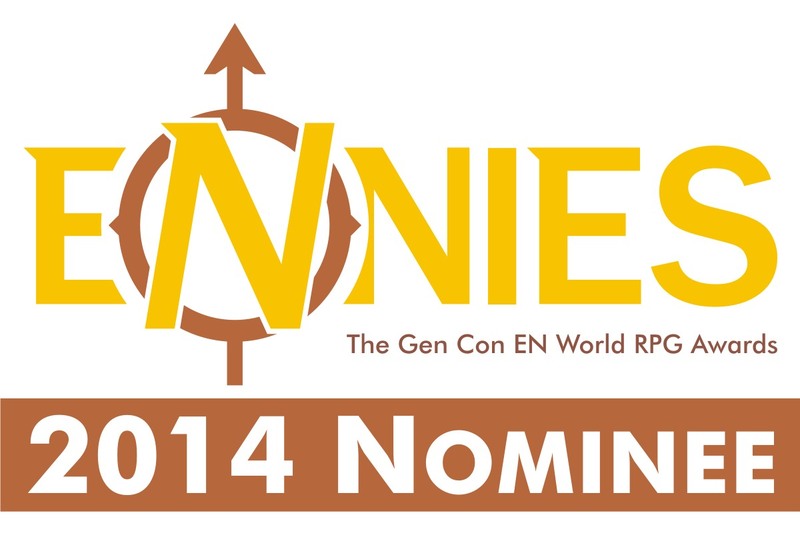 Considerations are given for Minor and Major NPCs, handling different sorts of combat situations, Roleplaying vs. The Rules, and Hazards. One thing that is quite interesting is advice on how to deal with divinations and how to work them into games. This time the authors DO mention the Shaowscapes Tarot by Stephanie Pui-Mun Law as the perfect resource for your Blue Rose games. I have a set and it is great. I am going to spend some more time on the Tarot, Callings, Fates, and Destinies. Chapter 11 covers Rewards. The beauty of Blue Rose is that there are many ways to grant rewards to characters beyond just level advancement. Though that is not understated here. We start with Honorifics. 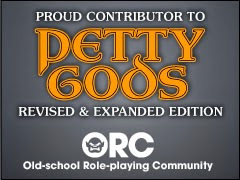 Which I am TOTTALY going to steal for D&D 5. These are accolades and acknowledgments. Titles like "Lady Aerin, Dragonkiller" (if you have read that book you can smile with me), or "Champion of Justice" and others. These confer a small in-game bonus as well. The criminal types all have to make Willpower tests at -5 around our Champion of Justice for example. Given these examples, I can come up with a lot more. The next section mentions who can give out these honorifics in each country and under what circumstances. Next follows Memberships and then Companions. After this are Special Items and Equipment. Often these are heirlooms, not necessarily magical. In fact, Arcane items are next and even then Arcane Weapons are listed last. Listed very last, and even very least, is wealth. So the things that motivate the average D&D character are the least motivating for the average Blue Rose character. In fact, Wealth only gets 3-4 paragraphs total. Chapter 12 gives us Adversaries. We lead off with NPCs. Blue Rose characters are more likely to run into other people (Rhydan are "people"; just ask them). For monsters, "Beasts", there are some familiar names here but don’t automatically assume you know what these creatures are about. Griffons, for example, are given more emphasis and intelligence here than in their D&D counterparts. This is completely due to how they are treated in the Romantic Fiction novels, in particular, the novels of Mercedes Lackey. Also, unlike the novels, there are a lot more creatures here than what I recall reading. So there are plenty of creatures that can either guide, beguile or challenge the characters. There are about 70 or so creatures here. They are grouped by type, so all Rhydan, all Darkfiends, all Unliving, and so on. Adding more would be easy, really TOO easy to be honest. Most creatures need have a good reason to be in the game/world. For example, there are no Manticores here. You could make a very good reason for them to be there as something like anti-griffon or even a magical race the bred true to fight griffons. Maybe they were created during the Shadow Wars or even before in the Empire of Thorns. They are rare now since most were killed. Now I do have a copy of the Fantasy Age Bestiary and there are a lot of great new monsters that can be added to Blue Rose. I just want to be careful on how I do it and where I do it. Same would be true for any monsters I'd add from DragonAge. There are slight differences in the stats between creatures of the same name in the various books, but not enough to make you think they are different creatures. The last chapter is an adventure, Shadows of Tanglewood. There are pages with Stunt References, Actions, and Quick Reference Cards. We also get a nice full-color character sheet. Points again to the PDF. You can get these as part of the Blue Rose Narrator's Kit. The index is fully hyperlinked. What can I honestly say at this point? This is a great game. Well designed with beautiful art and an absolute joy to play. The AGE system is the first system I have picked up in a long time that I really like. This is the best game of 2017. Now, let's do something together with this! I'm in, though I do have some issues with callings etc...also magic is something I'm looking at getting down, I like the simplicity of the Fantasy Age version. I have always loved a "mana" idea so that is why I'm partial to the "basic" FAGE magic. I have to spend some time with Fantasy AGE too. But yes. Let's get a new game going!